The pharmaceutical, biotech and medical device industries are increasingly facing a more challenging regulatory and enforcement landscape throughout Europe. 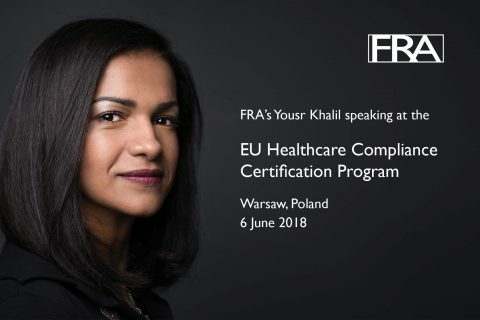 FRA’s Yousr Khalil is speaking at the EU Healthcare Compliance Certification Program in Warsaw on 6 June. The event addresses the myriad of legal, regulatory and compliance issues faced by pharmaceutical, biotech and medical device manufacturers working in healthcare compliance in Europe. Compliance programs typically associate forensic accounting and data analytics as methods to identify areas of misconduct after they occurred. Yousr will discuss the role of forensic accounting in investigations and the value of weaving it into compliance monitoring; how you can use data analytics to enhance compliance programs; how to identify and collect relevant data and how to manage potential risk prior to transparency report submissions.